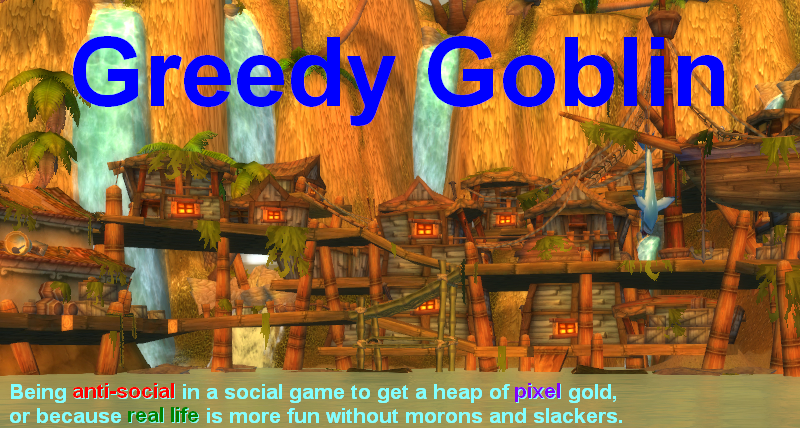 Greedy goblin: Weekend minipost: anyone's "playing" Chamelot Unchained? Weekend minipost: anyone's "playing" Chamelot Unchained? I've read lots of interesting things about Chamelot Unchained, with its extremely complex and thinking-rewarding systems and I like them. But the big question is "what's the point?" I mean what do you aim to achieve as a character in the game? I've read about "RvR PvP" but is there anyone actually in the beta who could tell what it is? What does the winner get and the loser lose? The worst thing I can get into is a complex game takes weeks to master and when I am finally competitive, I learn that the point is getting "l33t eppixxxlol" or "hav som fun xd". So let's skip how these heroes fight and understand what they are aiming for. The answer I'm looking for would be something like that in World of Tanks: there are arena battles between balanced groups of tanks and by performing well you get XP and credits to be able to buy more tanks. The goal is to get as many and as big tanks as you can! Or for WoW: there are group PvE dungeons called raids that you have to complete in order to get the "Ahead of the Curve" achievements proving that you could do it in short time and gear to improve your character. I think you have run into the problem many players have after playing a sandbox game, you cannot go back to games where you are unable to impact the world. Well, there are leaderboards, so you do have a goal to aim for. I haven't played all that much just yet, but it RvR is more like a design principle, there aren't any rewards per se. You can also capture territories, though I'm afraid that aspect is rather similar to BDO, you aren't really affecting anybody. Nonetheless, I'd recommend you to try the game, and see for yourself. Short version: Capture other realm's relics for stat bonuses and bragging rights. Capture zones for control over resources and access to the only dungeon. Dark Age of Camelot, the spiritual predecessor to Camelot Unchained is still my all time favorite MMO. Here is how RvR worked in it and Mark Jacobs has talked about RvR being similar to it in Camelot Unchained...of course we will have to see if that' actually so. Each of the three factions had their "home" frontier (very large zone) that was connected to the other realms frontiers. Each faction had a special relic in their frontier that the other realms would try to take. To do this you had to conquer specific castles in the their frontier to open the gate to the relic castle. You could also conquer other castles to reduce the guards at the relic castle or you could try to rush and deal with the overpowered guards. It was quite common to have 3 way fights of 100 on each side fighting during a relic siege. If you got the relic you then had to physically transport it back to your frontier's relic keep to protect it all the while being attacked by the other realms. For each enemy relic in your own relic keep you received bonuses to your stats, even for PvP. Guilds could claim castles as well which they then could upgrade (at a cost) to have stronger walls and better guards, thus making it harder for other realms to conquer your relics. This whole process changed over the years but the concept stayed the same. There was also a special dungeon (with bosses and mobs like a WoW dungeon but extremely huge and non-linear) that only could be entered in the frontiers by a faction dominating the frontiers. A cool thing was, when the dungeon switched hands, people weren't automatically evicted. You could stay and fight the new faction coming in until you died. The dungeon was big enough you could do hit and run style fights for hours or even a whole night with a good group and not be removed. For a long time crafted gear was the best for almost all situations. A few non-crafted trinkets/rings were good as well but crafting was very important. Also gear did degrade and eventually had to be replaced. Camelot Unchained is the only game I have ever pre-ordered (Kickstarter) as I really wanted to see it happen. I am fully aware that it might not turn out as hoped but its something myself and a group of friends have been looking forward to since DAoC. The most impact I ever had in a game is in Ark Survival Evolved. What ever you have can be wiped, destroyed and taken from you except learned crafts (called engrams, the powerful stuff needs "workbenches" tho) and level (allocating skillpoints in some RPG typical stats like HP, STA, MELEE DMG, SPEED etc). But there is no built in Market UI, so all trading is based on willingness of other players to interact that way with you. You can take players hostage (preventing them from playing the game to the point that they event can't suicide to a fresh spawn) so there is that to induce some willingness to trade. Most pvp players opt for raiding and hopping to hit the jackpot (rocketlaunchers and C4) to raid bigger bases to steal stuff to make their base. Once a group becomes alpha (meaning they decide who lives or dies on the server uncontested) ... you can give pve endgame stuff like breeding and summon bosses a try. Those bosses give as of writing this newest stuff called Tek Tier. breeding is very time consuming but will grant the most powerful dinosaurs ingame. the skill system is interesting and very diverse. in short you link skill gems with support gems together, linking can make for example a more single target skill to a more aoe skill with added effects. it has a bunch of mechanics that makes tinkering builds very engaging. sure if you cheat yourself out of thinking using the current season OP meta build to just die and die over again at endgame ... I guess there is no point in playing POE then. But not really a MMO or real gameworld impact. *Old grumpy voice* Back in my days, we played games to have FUN. If we had cool stuff to talk about afterwards, and if we had created new awesome memories to share over our next beer, then we had achieved something. When we wanted to actually achieve something, we would invade small countries with mercenary armies and then run their economy into the ground.. but games are more fun!